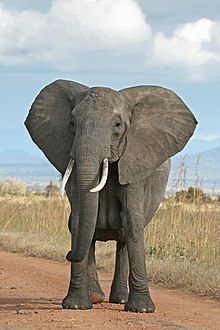 One species of African elephant, the bush elephant, is the largest living terrestrial animal, while the forest elephant is the third-largest. Their thickset bodies rest on stocky legs, and they have concave backs. Their large ears enable heat loss. The upper lip and nose form a trunk. The trunk acts as a fifth limb, a sound amplifier, and an important method of touch. African elephants' trunks end in two opposing lips, whereas the Asian elephant trunk ends in a single lip. In L. africana, males stand 3.2–4.0 metres (10.5–13.1 feet) tall at the shoulder and weigh 4,700–6,048 kilograms (10,362–13,334 pounds), while females stand 2.2–2.6 m (7.2–8.5 ft) tall and weigh 2,160–3,232 kg (4,762–7,125 lb); L. cyclotis is smaller with male shoulder heights of up to 2.5 m (8.2 ft). The largest recorded individual stood 3.96 m (13.0 ft) at the shoulder and weighed 10.4 tonnes (10,400 kg; 23,000 lb). The tallest recorded individual stood 4.21 m (13.8 ft) at the shoulder and weighed 8 tonnes (8,000 kg; 18,000 lb). The elephants' tusks are firm teeth; the second set of incisors become the tusks. They are used for digging for roots and stripping the bark from trees for food, for fighting each other during mating season, and for defending themselves against predators. The tusks weigh from 23 to 45 kg (51–99 lb) and can be from 1.5 to 2.4 m (5–8 ft) long. 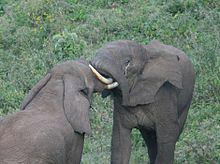 Unlike Asian elephants, both male and female African elephants have tusks. They are curved forward and continue to grow throughout the elephant's lifetime. Female African elephants are able to start reproducing at around 10 to 12 years of age, and are in estrus for about 2 to 7 days. They do not mate at a specific time; however, they are less likely to reproduce in times of drought than when water is plentiful. The gestation period of an elephant is 22 months and fertile females usually give birth every 3–6 years, so if they live to around 50 years of age, they may produce 7 offspring. Females are a scarce and mobile resource for the males so there is intense competition to gain access to estrous females. ^ a b c d e f Shoshani, J. (2005). 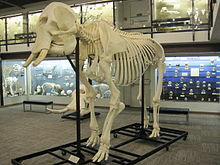 "Genus Loxodonta". In Wilson, D.E. ; Reeder, D.M (eds.). Mammal Species of the World: A Taxonomic and Geographic Reference (3rd ed.). Johns Hopkins University Press. p. 91. ISBN 978-0-8018-8221-0. OCLC 62265494. ^ Shoshani, J. (2005). "Loxodonta cyclotis". In Wilson, D.E. ; Reeder, D.M (eds.). Mammal Species of the World: A Taxonomic and Geographic Reference (3rd ed.). Johns Hopkins University Press. p. 91. ISBN 978-0-8018-8221-0. OCLC 62265494. ^ Shoshani, J. (2005). "Loxodonta africana". In Wilson, D.E. ; Reeder, D.M (eds.). Mammal Species of the World: A Taxonomic and Geographic Reference (3rd ed.). Johns Hopkins University Press. p. 91. ISBN 978-0-8018-8221-0. OCLC 62265494. ^ McComb, K.; Moss, C.; Durant, S. M.; Baker, L.; Sayialel, S. (20 April 2001). 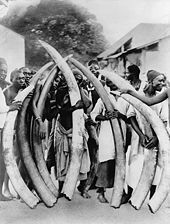 "Matriarchs As Repositories of Social Knowledge in African Elephants". Science. 292 (5516): 491–494. doi:10.1126/science.1057895. ISSN 0036-8075. ^ Clauss, M.; Frey, R.; Kiefer, B.; Lechner-Doll, M.; Loehlein, W.; Polster, C.; Roessner, G. E.; Streich, W. J. (24 April 2003). "The maximum attainable body size of herbivorous mammals: morphophysiological constraints on foregut, and adaptations of hindgut fermenters". Oecologia. 136 (1): 14–27. Bibcode:2003Oecol.136...14C. doi:10.1007/s00442-003-1254-z. PMID 12712314. Retrieved 8 January 2012. ^ Aldous, Peter (30 October 2006). "Elephants see themselves in the mirror". New Scientist. Retrieved 29 August 2010. ^ Parsell, D. L. (21 February 2003). "In Africa, Decoding the 'Language' of Elephants". National Geographic News. Archived from the original on 12 October 2007. Retrieved 30 October 2007. ^ Scott, David (19 October 2007). "Elephants Really Don't Forget". Daily Express. Archived from the original on 12 March 2008. Retrieved 30 October 2007. ^ Roca, A. L.; Georgiadis, N.; O'Brien, S. J. (12 December 2004). "Cytonuclear genomic dissociation in African elephant species". Nature Genetics. 37 (1): 96–100. doi:10.1038/ng1485. PMID 15592471.